Semi-desert. Woodlands, grass and shrublands, openings. Spring. Astragalus mollissimus is the most common Astragalus in the Four Corners area. It is characterized by hairy flower stems; numerous, hairy, small, light green leaflets, usually arching; long and narrow pink-purple flowers that have a pronounced backward flare at the upper tip of the rather small banner; and, as shown in this photograph, very hairy seed pods that are often curved into a sphere. 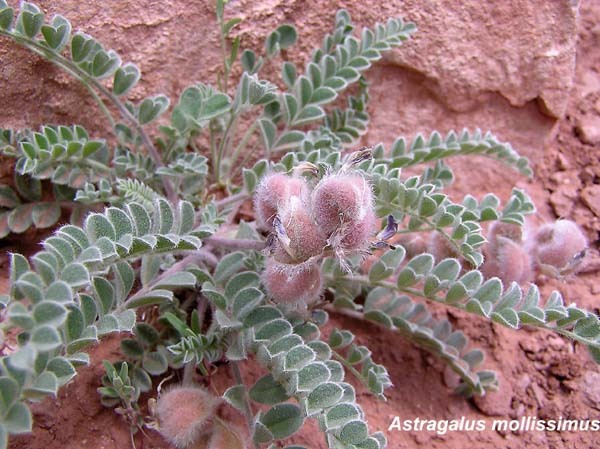 Astragalus mollissimus blooms profusely in the spring (and often again in the fall) and where you find one plant you will usually find many. "Mollissimus" is Latin for "very soft". "Locoweed" refers to the plant’s effect on grazing animals, especially sheep.